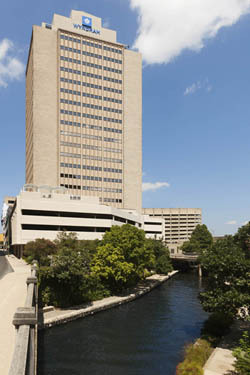 You’ll always remember your stay at the Wyndham San Antonio Riverwalk when you experience its luxury and opulence. From the deck of our third floor rooftop pool with its breathtaking views of the San Antonio skyline to our contemporary lobby designed for intimate gatherings, our San Antonio Riverwalk accommodations are sure to rejuvenate and delight visitors traveling to sunny San Antonio. Relax in the hotel’s newly renovated guest rooms and enjoy some of today’s most desired Riverwalk hotel amenities or savor contemporary regional fare in our lobby-level restaurant for the complete San Antonio Wyndham River Walk experience. Edu-Tech and Edu-Tech Academics are invitation-only Summits for the heads of technology and curriculum and instruction from the largest school districts in the country. Registrations are complimentary via scholarships for school district administrators and include 2 nights of accommodations at the Wyndham San Antonio Riverwalk, meals, networking functions and access to all conference sessions. Edu-Tech and Edu-Tech Academics are designed to change the school districts discover solutions. We provide the ability to learn about cutting-edge solutions with proven results used by other districts across the country. The relaxed atmosphere provides the opportunity to have open and candid conversations with senior executives to discuss industry trends and challenges. Prior to the meeting, attendees will make selections of the roundtable topics they choose to participate in based on their districts’ priorities and needs. The senior executives within the solution organizations moderate scheduled roundtables creating the opportunity for districts to share their challenges with those at the table and walk away with actionable information.